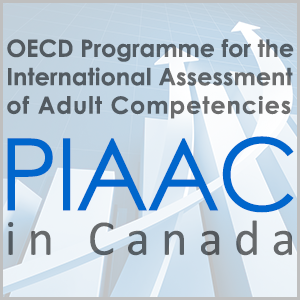 The Programme for the International Assessment of Adult Competencies (PIAAC) is OECD's first-ever international study of the skills needed for the economy and society of the 21st century. PIAAC has measured skills in literacy, numeracy, and problem solving in technology-rich environments (PS-TRE) among adults between the ages of 16 and 65 in 33 countries and sub-national regions. In Canada, more than 27,000 people were surveyed to allow findings at both the pan-Canadian and provincial/territorial levels and among off-reserve Indigenous populations, immigrants, and official-language minorities. Visit us at www.piaac.ca for more information. PIAAC was sponsored in Canada by provincial and territorial ministries and departments responsible for education, under the aegis of the Council of Ministers of Education, Canada (CMEC), Employment and Social Development Canada (ESDC), and other partners. The survey was administered in Canada by Statistics Canada.